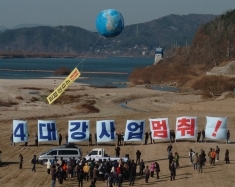 The 4 Rivers Project is a massive government river diversion and restoration project covering South Korea's four main river systems (including 14 tributaries which has received additional funding) and was the most emblematic of President Myung-bak Lee's infratructure projects. It replaced President's initial project of the "Korean Grand Canal". Its stated aims were to provide better water security in the face of expected scarcity and also for flood prevention (both droughts and heavy rain/flooding are common problems in S. Korea). It was also intended to extend leisure activities in and around the restored river systems. Extensive dredging and construction of weirs and dams took place. It met with criticism from scientific circles and environmental movements. Impact Assessment for this huge project was completed in only 5 months instead of the minimum 1 year according to expert opinion. Resistance and protests against this macro project involved lawsuits and local demonstrations where work on rivers was taking place. The protests brought together a wide range of citizens groups, academics, religious leaders, environmental activists.